Two weeks of Fall Camp are just about in the books and it’s at this time that fans want to know who’s having the best camp and what players to be most excited about. More often than not, fans are looking for new names as they know what to expect from the returning players and it’s just natural to be curious about the “new blood” with so much turnover from one year to the next in College Football. Rest assured, the star players from a season ago, Craig Mager, Mike Orakpo, David Mayo, Tyler Jones, Ben Ijah, Robert Lowe, Adrian Bellard, etc. are all having solid camps and will all be leaned upon for big things in 2014. So who are some unfamiliar names standing out in camp? Well, CB David Mims II (who did play last season but backed up Mager & Xavier Daniels), OL Ryan Melton, DE Kris Peterson, WR C.J. Best, LB Darnell Dailey, DE Jeff Banks and DL Will Trevillion have all been players that either the coaches or their teammates have pointed out as having strong camps or are much improved from this time last year. As far as true freshman are concerned, they are all getting in plenty of work but ideally the coaches would like to redshirt as many as possible this season (such as WRs Demun Mercer & Brice Gunter last year). But, as we have seen over the past few seasons, Coach Fran isn’t afraid to play freshman right away (Jones, Bellard). So the question remains, who is having the best camp, and which newcomer can we expect to have a huge impact this season? The answer to both is RB Terrence Franks. Franks, a senior, obviously isn’t a newcomer but let me explain. After an outstanding redshirt freshman year in 2011 (12 games, 8 starts, 863 rushing yards, 9 TDs), Franks hasn’t been the same the past two seasons (combined 24 games, 4 starts, 470 yards, 7 TDs). There are a few factors that come in to play, such as an increase in competition (Southland-WAC-Sun Belt) and positional competition (Marcus Curry, Robert Lowe, Chris Nuttall) eating into his carries. However, playing time is earned, and those players simply had better practices, camps and games than Franks, decreasing his workload. That could change this season. While Robert Lowe (a Doak Walker candidate for nation’s best RB) will be the Bobcats’ first team running back, he carried the ball 164 times last year, which out of the 298 carries for the team’s backs comes out to 55%. Assuming that number will be close to the same in 2014, there will once again be an ample amount of opportunities for the bench. Chris Nutall had 83 carries to Franks’ 42 in 2013, but those carries could be more evenly dispersed this year based on what Franks has done in camp so far. It seems that every day throughout camp that Franks is breaking off long run after long run, and everyone has taken notice. Co-Offensive Coordinator/RBs Coach Jeff Conway says Franks entered fall camp self-motivated and that he’s been working “like a maniac”, realizing that the end of his college career is coming up. Something else that Coach Conway and Coach Fran have pointed out is that Franks’ pass-protection has vastly improved, something that kept him off the field in passing situations over the past two seasons. So when I label Franks as a “newcomer”, it’s because we’re seeing a Terrence Franks we haven’t seen before at Texas State. - Coach Conway says the no-huddle offense could be very beneficial for the team’s running game, with linemen paving bigger holes for backs to run through against a worn-down defensive front seven. - The offense is really standing out at camp so far, and Coach Conway gives two reasons for that: 1) The offensive line is as deep as ever since the ‘Cats moved up to the FBS and 2) Tyler Jones has been outstanding. The best Fall a QB has had at Texas State in quite some time. - The coaching staff wasn’t pleased with the play of the defense during Friday’s morning practice. 1st year Defensive Coordinator John Thompson says camp started well for the defense, but the entire unit has hit a lull and it needs to push through it. - I asked Coach Thompson if communication is the issue (several new starters, new defensive coordinator) and he said it isn’t; it’s more execution right now. Specifically, missed tackles. - When talking about defensive line, the biggest unknown going into the 2014 season, Coach Thompson harkened it to a “picture at the mall” (I assume he means those 3D pictures) where it’s not yet in focus. The staff is still piecing together the D-line depth chart, and we might see some moving parts as the season progresses. 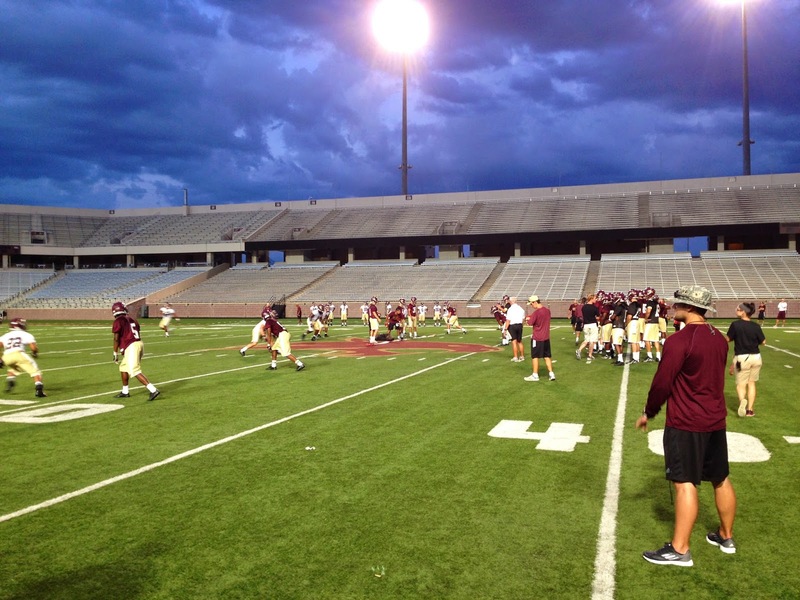 The crashing of shoulder pads can now be heard as the Bobcats are adding more and more (and new) gear with the first week of Fall Camp nearing an end. The one-on-one drills have been amped up, lineman are able to engage against one another, and we have also seen the start of the “Bobcat Drill”, where an offensive player tries to stand up a defensive player and keep him from getting to a ball carrier. At first glance yesterday (Day 4 of camp), several starting defensive players got the better of their offensive counterparts, including projected DL starters Dallas McClarty, Darius Hood and Michael Odiari. That was promising to see. Everyone’s eyes lean toward the biggest position battles in camp, and this season that distinction belongs to the Bobcats’ defensive line. Blake McColloch, D.J. Yendrey, Jamie Clavell-Head, Jordan Norfleet and Kamu Taulelei are all gone from last year’s team, each starters at various times (in McColloch’s case, all 36 games for Coach Fran) in their Bobcat careers. In speaking with Defensive Line Coach Mike Hudson after practice, he named Odiari and McClarty as two d-lineman standing out in the first week of camp, along with RS Freshman Jeff Banks. The player that Coach Hudson noted as the most improved over last year was DE Kris Petersen. If you’ll recall, Peterson was recruited to Texas State as a tight end, but as the season progressed last season, Petersen (6’4” 232 lbs) was slotted onto the defensive line in pass rushing (3rd and long) situations. After a year of experience (not just in games, but practices which Coach Fran points out is just as important), Petersen may be more than a “specialist”. Coach Hudson says that he has a chance to be an every down DE. Something else to keep in mind, is that under 1st year Defensive Coordinator John Thompson, the Bobcats will be more multiple with their defense, to include the line. We could see a mix of 4- and 3-man fronts with the linebackers serving as pass rushers. However, when it comes to playing the position of defensive lineman, Hudson reiterated that “football is football”. Beat the guy in front of you and you’ve done your job. Unlike the defensive line, the offensive line doesn’t have many question marks. There’s only one starter (Devin Baker) gone from last season, and all of the projected starters have plenty of experience, the most of which belongs to the line’s only senior (among the starters): Charlie Will Tuttle. Originally a walk-on at Texas State, Tuttle has since become a scholarship player and told me that without a doubt, THIS year’s line is the deepest and most talented when compared to his previous 3 seasons. The projected starting five lineman are Adrian Bellard and Ryan Melton at tackle, Tuttle and Felix Romero at guard and Matt Freeman at center. Tuttle, who has played center, says he will stick to guard this season but is moving from playing next to Bellard last season to playing alongside Melton this season. Melton, by the way, was the answer given to me by Tuttle when I asked him who has been the most improved offensive lineman since last season. Offensive line and quarterback were two HUGE question marks last year and that’s not the case this season which gives reason to believe that Texas State’s offense (23.9 PPG in 2013) will play much more consistently in 2014. 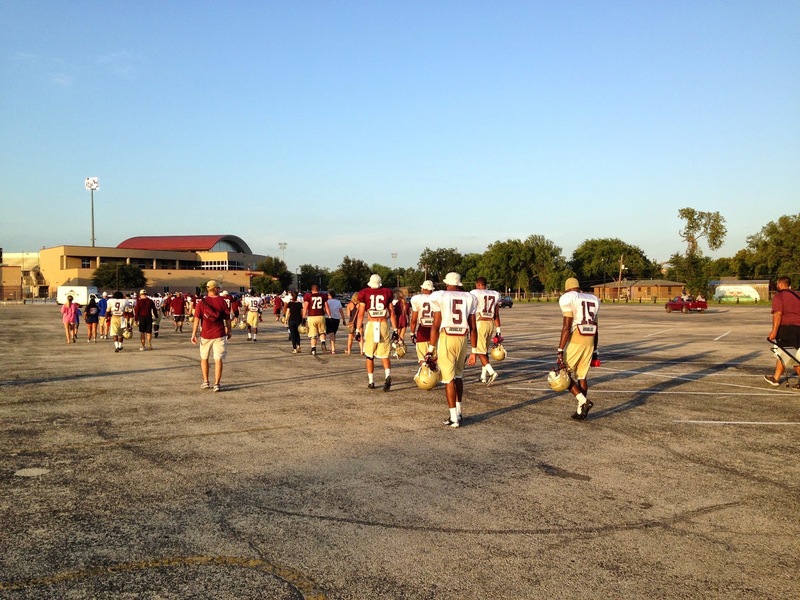 - The Bobcats ran a KOR (kick-off return) drill, sending 10 players deep to receive footballs from a machine. The 10 players were C.J. Best, Craig Mager, Dila Rosemond, Tyler Watts, Brennan Blakemore, P.J. Anderson, Terrence Franks, Brandon McDoweell, Jafus Gaines and Brandon Smith. - Speaking of Franks, in 11-on-11 near the end of practice, he stiff-armed Mager on his way to a long run, but didn’t score. The man who caught him? Mager. - The two highly touted receivers from last year’s recruiting class, Brice Gunter and Demun Mercer, were redshirted in 2013 but could each play a significant role in the offense this season. Each got reps with the 1st team offense last night, and Gunter in particular was making some pretty incredible catches all night, whether in drills or in 11-on-11. - When Mike Orakpo got a breather with the 1st team defense, Trey McGowen was subbed in his place. Not a name we’ve discussed much when it’s come to LB depth, so that’s definitely something to keep an eye on. - In my last blog, I wondered who would win the battle of back-up QB to Tyler Jones. According to Coach Fran, Fred Nixon is the front runner. #BobcatAccess question of the day from Felipe (@caldeira8felipe): Who, so far, is looking like the most improved player since last season? I would say David Mims II. He got some playing time last season behind Mager and Xavier Daniels but his role will increase this season and he’s earned it. He’s been playing CB with the first team defense and I haven’t seen too many passes completed against him. The Bobcats will need him to keep it up in order to keep the pressure off of Mager. Keep the questions and comments coming to #BobcatAccess, we’ll try to cover as much as we can leading up to the season opener (Aug 30th vs UAPB). 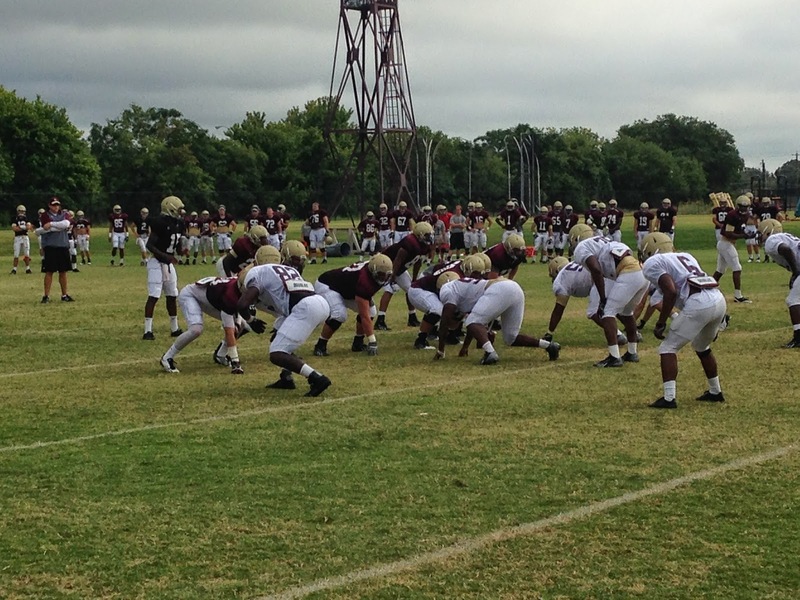 We’ll have a couple of podcasts coming your way next week from the Texas State Media Days. Until then, Eat ‘Em Up and Go ‘Cats! First, it’s exciting that football season is almost here and expectations are high after the Bobcats came oh so close to earning a bowl invite a season ago. I’m definitely looking forward to covering the 2014 season and as you’ve probably noticed by now our coverage started at the SunBelt Conference Media Days from New Orleans. There’s more video, audio and written content available online than there’s ever been before in the lead up to a Bobcat football season. Given where the program is heading, that’s only going to increase from here on out. - Unlike last year, the Bobcats know who the starting quarterback will be for Week 1 and throughout the season in Sophomore Tyler Jones. That takes a lot of the pressure off of the offense since it can be tailored to one individual and everyone can buy into one QB instead of favoring one over the other. - What will be interesting to find out is who wins the role of Jones’ back-up. Connor White, Randy Price and Fred Nixon will be battling out for the role of 2nd string QB which is obviously a pretty important job. Just because TJ has a lock on the starting job doesn’t mean we should ignore QB play throughout camp. - Even though Jones is the sure-fire starter for the coming season, I had a chance to speak with him after Day 2. He’s not taking the job for granted and has put in a lot of work to be ready for the fall. He looks every bit the part so far. - Jones was 4-3 as a starter last year, and two of those losses were to the 1st and 2nd place teams in the Sun Belt: Louisiana-Lafayette and Arkansas State. - Who will Jones throw to now that Andy Erickson and Isaiah Battle are gone? Ben Ijah was his favorite target last year, and Brandon Smith will likely start as well. CJ Best has been running with the 1st team offense early in camp, and I expect we’ll hear from Jones’ old HS teammate Brice Gunter as well. Very elusive and could be a difference maker this season. - In the words of Coach Fran, the offensive line finally looks like a legit D-I FBS group and when looking at the depth it’s easy to agree. Charlie Will Tuttle (SR), Adrian Bellard (JR), Matt Freeman (JR), Felix Romero (SO) and Ryan Melton (SO) are all experienced lineman and the youth behind them is promising as well. Freshmen Tryston Mizerak, Jackson Hoskins, Will Copa, Kian Schoenborn average out at nearly 6’6” 300 lbs. The Bobcats have a total of 16 offensive lineman on the roster in camp, so look for some intense competition over the next couple of weeks. - The biggest unknowns on defense are upfront and at the safety position. During some 1st team offense vs defense drills, Michael Odiari and Thomas Evans were getting reps at defensive end, while Dallas McClarty and Darius Hood were at DT. Kris Peterson will likely factor as a pass rushing specialist and there are quite a few newcomers from junior colleges who will get opportunities on the defensive line throughout camp as well. - As far as safeties are concerned, Colby Targun is the only returning starter from a year ago now that Aaron Matthews and Justin Iwuji are gone. The Bobcats won’t always have three safeties on the field under 1st year Defensive Coordinator John Thompson, but when they do, it could be Targun, Germond Williams and Damani Alexcee. The safety’s role in Coach Thompson’s defense is something to keep an eye on throughout the season. - Craig Mager is a really good cornerback and that puts pressure on the CB playing opposite of him, and Xavier Daniels played really well in that position last season. With “X” now gone, that role is likely going to fall to David Mims who definitely possesses the speed necessary to play the position in what is a WR loaded Sun Belt Conference. Establishing depth behind Mager and Mims will be key in Fall Camp. - Fans may have noticed that the players have been practicing in the maroon helmets which were first introduced last season. The team will likely alternate between gold and maroon helmets throughout the season so look for some interesting uniform combos this year. Only a couple of days into fall camp and there’s so much to look for over the next few weeks. There’s a lot of excitement on both sides of the ball, and one of the assistant coaches told me to anticipate a lot more scoring from the offense this season. Couple that with a DC with a proven track record in Coach Thompson and the Bobcats have every reason to feel confident heading into 2014. Until then, Eat ‘Em Up!